When I was asked by US Games if I would be interested in receiving an advance review copy of Patrick Valenza's new Deviant Moon Tarot , I was very excited. I had seen a few scans of this deck in progress months earlier, and was quite interested in seeing the finished product. When I opened the deck, I was blown away. I had expected that after the first few cards, they would all begin to blend in together, just more of what I'd already seen. Card after card, I was surprised and delighted at every spectacular new image. I have never been more fascinated and impressed with a deck. "The Deviant Moon Tarot deck was created using various forms of photographic manipulation. Each card began with a complete drawing, which was then scanned into the computer where I applied various photographic textures. Nineteenth-century tombstones provide most of the clothing worn by the citizens of the Deviant Moon. I bent, twisted, and reformed my photos to become capes, boots, hats and trim. One of the best aspects of creating the deck was 'hunting' for specific textures as I respectfully tiptoed around the graveyards of eastern Long Island, New York. Background buildings were created with photographs I took of a local abandoned insane asylum. Rotted doors, windows and walls became castles, factories and cities." The magic of this deck is in its ability to captivate and lure you into this fascinating world. Many times when I'm looking at a deck that strays from traditional RWS imagery, I tend to see flashes in my mind of the RWS equivalent meanings as a comparison. While the Deviant Moon doesn't follow traditional imagery, as soon as I look at one of the cards, I automatically know what card it is, and I've found that before my mind is able to flash to the RWS "meaning" in my head, the artwork forces me to bypass that step, as it pulls me in further and asks more of me. I am drawn to delve deeper into the card, experiencing additional layers of meaning. There is some talk among the tarot community of this deck being really dark. However, I don't see it that way at all, and when communicating with the artist, he confirmed that it wasn't ever intended to be a dark deck. He explained that it was based on his childhood imagination, a twisted world which is at times a bit melancholy, yet includes elements of humor as well. After working with the deck for a week, I can definitely attest to the fact that the images inspire imagination. The characters, for the most part, aren't maniacal or creepy. They are unique and engaging, and not without emotion. I find the artwork captivating and intriguing, though I do not consider it a dark deck. The cards themselves are taller than the average tarot deck, which can make repeated shuffling uncomfortable. I do like the dimensions of the deck, with the length being unusually longer than the width, but it would have been nice if the cards were a little easier to handle, keeping the same dimensions, but making the cards a bit smaller. I'm a big fan of trimming borders off of decks, and doing so would make this one easier to handle, but I think the white borders actually help keep this deck from appearing too dark (literally dark in coloring, not figuratively speaking). I'd be delighted to see a pocket version of this deck packaged in a tin! Valenza's use of color is striking and leads your eyes on a parade around each card, so that you notice the smallest details, down to the color of toenail polish on the characters' feet. The Aces in this deck really stand out, as they are extremely elaborate. Rather than featuring the usual solitary symbol of a cup, wand, sword or pentacle, the Deviant Moon Aces are fully illustrated with characters. "Swords are angst ridden beings set in a medieval world... Cups are people comprised of fish parts as well as gravestones...Wands are folks with a tribal, peasant mix, whose bodies are blended with insects and leaves... Pentacles are based on decayed industry...circa 1890's ish..."
The originality of Valenza's mastering and blending his artwork with tarot is stunning. I am completely enchanted by the Wands suit of this deck. Ordinarily, it's visually my least favorite suit. This deck has made me love Wands, and that's no small feat! In fact, this deck features so many cards that immediately stood out as my favorite version from any deck, due to their original portrayal. My least favorite card? The Hermit. The Hermit is usually one of my very favorite cards in a deck, and one of the first I seek out when looking through a new deck. So I was a bit disappointed initially that the hermit in this deck is depicted as a tortured soul who appears to be on the brink of madness. That's not at all how I think of the Hermit, so this deviation from one of my favorite cards was really the only one that I wasn't thrilled about. However, upon further reflection, I now see more into it. I don't think this soul is tortured by the solitude, but rather tortured into solitude. I think it is the pressures and insanity of society that has driven him (and drives us) to seek solitude, as though he'll go mad unless he can get away from it all for awhile. Looking at it that way enabled me to relate much more comfortably with this card. Even my least favorite card was transformed into understanding when I allowed myself to look deeper. And that is the true beauty of this deck. My eight year old son requested the first reading out of the box. He asked if we were going to be able to see his grandfather soon. I drew the Page of Cups, King of Pentacles and Four of Swords. The Page of Cups is the card that always represents my son. The King of Pentacles is my father (complete with round belly, cranky face and earring! ), who is recovering from a serious illness (Four of Swords). The Page of Cups has his back turned to the King, indicating that he quite literally can't see him right now. The King is still recuperating. The deck spoke to my son directly, as though it were a person rather than a set of cards, clearly indicating my son and his grandfather in the first two cards, and the situation was loud and clear in the third card. In addition to my daily draws, I have done a few other readings with the Deviant Moon this week, and have found the deck to be equally as forthcoming and clear in those readings as well. Once the initial overview is clear, the images then draw me in further to elaborate and refine the reading. When laid out, the cards flow together so well and tell stories as though the artist had designed those cards you selected to specifically go together. The Little White Book which accompanies the Deviant Moon is deck-specific and written by the artist. Both the Majors and Minors feature commentary on the cards by Valenza. He also includes an introduction in which he shares details on the creation of the deck. 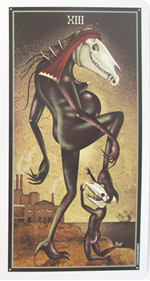 There is a 10-card spread included called The Lunatic Spread, which is appropriately moon-shaped. Six blank pages for notes pull up the rear of the LWB. 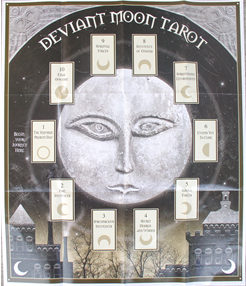 The Spread Sheet included with the Premier Edition (shown at left) is custom designed for the Deviant Moon Tarot, and displays The Lunatic Spread from the LWB. Spread sheet measures approximately 17" x 20" and folds up for easy storage. 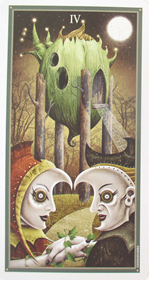 It should be glaringly obvious how enchanted by and enamored I am of the Deviant Moon Tarot. The originality of this deck far exceeds any other I've seen, and the power it has to draw you into the world of imagination is amazing. I was thrilled when Patrick told me he is working on a sister deck to the Deviant Moon, as well as a decidedly dark deck. I believe his innovative artistic contribution to the world of tarot is greatly needed and will continue to be deeply appreciated and celebrated. 2017 Update: Read my review on the companion Deviant Moon Tarot book! 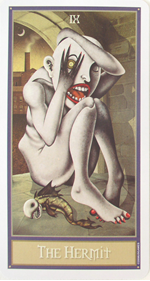 Card Size: 2 3/4" x 5 1/8"
Deck: Deviant Moon Tarot published by U.S. Games Systems, Inc. 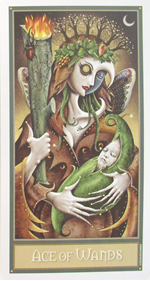 This deck review was originally published on my previous blog (Tarot Dame) on 6/16/08.